Want to start a Travel Blog but don’t know where to begin? This insanely actionable travel blogging for beginners guide walks you through exactly how to start a travel blog that can make you money and keep you travelling for longer. Starting a travel blog can be REALLY confusing. There is so much conflicting information out there that it’s difficult to know which advice to follow. Well, it turns out, you can easily set up your travel blog, design your website and write your first post a lot quicker than you ever thought possible. And in today’s post, I’m going to walk you through exactly how to start a travel blog with WordPress that can make you money and keep you travelling for longer. The first step when starting a travel blog is choosing a unique domain name (the name of your website). Too many people spend weeks and weeks trying to come up with the perfect blog name (I’m guilty of this) and never end up starting their blog. Luckily there are a few things you can do (and avoid) so that choosing a domain name is easy. You want to have a name that’s easy to remember and that explains what your blog is all about. For example, ‘Travelling-The-World-For-1-Year.com’ is a bad travel blog example because it’s too long, includes a number (which you then have to explain whether it’s a ‘one‘ or ‘1‘) and uses hyphens. You want to try to avoid using hyphens and numbers because each time you tell someone about your blog, you’re going to need to explain how to type the URL. If you use a name such as ‘SouthAmericanTourist.com’ or ‘MyYearAbroad.com’, you’re going to run into problems. What happens if you want to travel longer or to different locations? It’s time-consuming and difficult to change blog names, so make sure you don’t pigeonhole yourself to a specific location or certain timeframe. Nomadic, Traveller, Vagabond, Wandering, Adventurous etc. are all words that have been used to death. More established blogs already use these words so you’ll find it more difficult to stand out from the crowd. You want people to see the name of your blog and know exactly what your website is about. My blog is all about living abroad and travelling long-term so “Move Your Life Abroad” was an easy pick for me. The best way to think of a great travel blog name is listing words that describe your blog. What’s unique about the way you travel? Write down a list of words that best describe the type of travel you enjoy and use a thesaurus to find unique words that are less commonly used but still sound great. After you’ve listed a few words that you like the sound of, visit Bust A Name and type in the words into the left column. This fantastic tool will mix the words together and give you a list of available domain names. Obviously, you should come up with more creative words than I have in the above image, this is just an example to show you how the tool works. After you’ve decided on a name, you need to make sure the domain name is available, and if it is, buy it. To do this, go to GoDaddy and start entering some of the domain name ideas that you like. Type the domain name ideas (that you created in Bust A Name) into GoDaddy and double check they are still available. Now that you have an awesome domain name, you need to find somewhere to host your website. Many people get confused about what hosting actually is. Simply, you need to have somewhere on the internet to store all of the data from your blog including your photos, articles, media etc. and that’s what hosting companies are for. They store all of your information so you don’t have to! For beginners, I recommend using BlueHost. Their incredible support team makes it easy to handle any problems that arise (they will!) and are perfect for beginners who don’t have any experience running a website. They usually have an introductory offer where you can get a free domain name and hosting plan for only $3.95/month. Type in the domain name that you’ve checked is available on GoDaddy and purchase your hosting plan with BlueHost. If you’ve already purchased your domain through GoDaddy or Bust A Name then you can insert that domain name in the box on the right of the screen in the image below. After logging in and setting up your payment details you’ll arrive at the Blue Host dashboard. This dashboard can be quite confusing at first glance but don’t worry! All you need to focus on for now is clicking the button that says “Install WordPress“. Wait, there is WordPress.com and WordPress.org? Essentially no matter what, you’re going to need to use WordPress.org to run your website. WordPress.org is the software that actually runs your website (no matter if you are self-hosted (Blue Host) or fully hosted by WordPress.com. However, if you want to host your website for free using WordPress.com instead of another hosting company such as Blue Host, you can do that as well. Can you see how much more professional the second name looks? Would you take a website seriously if its URL was ‘www.NameOfWebsite.Wordpress.com‘? If your blog is just going to be a hobby to share your adventures with friends and family, then using WordPress.com is fine. However, if you want to take your blog seriously and make money from it, you’re going to need to self-host your website using a hosting company (Blue Host). Try to use the analogy that running a website is like running a car. All of this will start to make more sense as you progress step-by-step through this article. After you’ve clicked the ‘Install WordPress‘ button on the Blue Host dashboard you need to select the domain name that you just purchased in the ‘Select domain for installation‘ section. The ‘directory name‘ section can be left blank for now. After that, you’ll need to create a login for WordPress. Using WordPress can be overwhelming at the start, so if you need any help, I recommend checking out WpBeginner who have hundreds of easy to follow videos on every question about WordPress you’ll ever have. If you can’t find the answer you’re looking for on WpBeginner, simply type your question into Google and you’ll find the answer. By now, you should have bought a unique domain name, set up your hosting account with BlueHost and installed WordPress. It’s time to install a theme and design your blog. After installing WordPress you’ll be logged into the WordPress dashboard. This is where you control your whole website! From the WordPress dashboard, navigate your way to the ‘Appearance‘ tab in the sidebar and click ‘Themes‘. A theme is the design of your website. Rather than having to learn how to code or pay someone to design your website, you can install a theme and optimise it yourself. While there are many free themes out there, if you’re going to take your blog seriously (and plan on blogging for a while), I recommend buying a premium theme ($20-$80 USD). Unfortunately, the free themes lack support, customization and aren’t optimised for SEO (which drives traffic to your website). If you prefer to pay a designer to set up a professional looking blog, you can find them on UpWork or 99 Designs. This is going to cost you anywhere between $1,500-$5,000 USD. Purchasing a premium theme and optimising it yourself will not only save you money but teach you how to run your website and customise it however you like. Whereas if you pay a designer, every time you want to change something (which will be more often than you think), you’re going to need to contact your designer and pay them again. Some great places to buy premium themes include Studio Press, Theme Forest and Elegant Themes. You can buy each of their products separately or pay a monthly membership (recommended) to use all of their products starting at $19 USD a month. The reason I love Thrive Themes so much is the content builder. When building your pages, the changes you make happen in real-time which means you know exactly what your site is going to look like. Watch the video here to understand what I’m talking about. After purchasing your premium theme and downloading it to your computer, you’re going to need to install it to your WordPress blog. The great thing about installing a premium theme is that all of the pages are already created and designed for you. All you need to do is tweak the design to your liking and add information to the pages. To add plugins, click the ‘Plugins‘ button on the sidebar and ‘Add New‘. This plugin is very important because it will help you rank in Google search and drive more traffic to your website. Unfortunately, most websites receive spammer comments on their blog posts. This plugin helps automatically filter spammer comments so they don’t appear on your site. People who sign up to your email list are engaged readers who are more likely to buy from you in the future. This is one of the best plugins out there for capturing email signups and has many different designs and split-testing features. More than half of traffic driven to top websites is from mobile devices. With this plugin, your website will be mobile friendly meaning a better user experience for mobile users. After spending so much time working on your website, you’d be crazy not to back it up. This plugin allows you to automatically schedule regular backups to Dropbox and other cloud storage services, so you can set it and forget it. When you first launch your website you won’t be receiving much traffic. However, after a little while, your traffic will start to increase and this plugin will give you important information about your reader demographics and traffic sources. This plugin saves copies of the pages from your website, meaning WordPress doesn’t have to generate new ones for each reader. Essentially this means that your website will load much faster and keep readers coming back to your website. This plugin is perfect for adding a contact form to the ‘Contact Page‘ of your website, making it easier for people to get in touch with you. By now you should have designed your website and created all of the pages that I suggested above. It’s finally time to write your first blog post! There’s a lot of information out there on how to write a travel blog post but for your first post, you should talk about what made you start the blog, your travel experience and goals for the future. Essentially, you want your first post to be an extended and more in-depth version of your about page. If you don’t have much experience writing, you’re probably going to find it difficult to write your first travel blog post (I know I did). Pretend like you’re writing an email to a friend and don’t spend too long trying to perfect your first post. The more you write, the better you’ll become. If you’re really looking to kick-start your travel writing with a bang, I suggest taking Nomadic Matt’s Travel Writing Course. Beyond your first blog post, there are many topics that you can write about. Destinations, Travel tips, travel stories, crazy adventures, food recommendations etc. If you aren’t travelling at the moment, write about previous trips you’ve taken, things to do in your local city or what you plan on packing for your next overseas trip. If you still can’t come up with any content ideas, read this article. The trick is to write engaging content that will keep readers coming back. You want your audience to take something positive away every time they visit your website and read your posts. So take time and care producing the most compelling content you can. Posting on social media and creating a brand is going to be extremely important for acquiring traffic to your blog. Learning how to promote yourself on social media is part of learning how to start a travel blog. Even if you don’t plan on diving into social media straight away, it’s a good idea to reserve the same social media handle across all platforms (I didn’t do this and my social media following is lacking because of it). For example, if your blog is called “AdventuresOfYourName.com” you want all of your social media handles to be “AdventuresOfYourName“. This will make it less confusing for people when searching for you on the different social media platforms. Most people think that Email Marketing is an advanced marketing strategy that should be ignored when learning how to start a travel blog. Creating an email list on your blog is one of the most important first steps. The people that sign up to your email list are usually engaged readers and loyal fans. With email being a more personal and intimate form of contact, your email subscribers will be more willing to share your blog posts and potentially buy products from you in the future. How to get Email Subscribers? The easiest way to get people to sign up to your email list is by offering an incentive, otherwise known as a lead magnet. This is a piece of valuable content that is sent exclusively to people who sign up to your list. –How Anyone Can Earn Money Abroad In 48 Hours! I’m able to create these landing pages and catch people’s email addresses through an opt-in software called Thrive Leads (which I mentioned earlier). There are many different email marketing companies out there and it can be confusing to know where to start. Mailchimp is the most popular email marketing company for beginners because it’s free (for your first 2,000 subscribers) and easy to use. Unfortunately, with Mailchimp and other basic email marketing software you’re very limited in what you can do. I use Active Campaign for sending all my emails and I LOVE IT! Well, if for example, you create a 5-day email series on “How To Move Your Life Abroad In 30 Days” as a lead magnet, you would be able to create a custom automation that sends those 5 emails over the course of 5 days, rather than having to send each email individually. You can see that I’m able to tell Active Campain to wait 1 day before sending each email so that I don’t have to manually email each email subscriber every day. For more information and video tutorials on the Automation possibilities of Active Campaign, check out their website. Most people want to learn how to start a travel blog for the sole reason of making money from it. Unfortunately, travel blogging is extremely competitive and it normally takes anywhere between 1-2 years before you’re making enough money from it to be travelling full-time. However, if you’re a motivated and passionate blogger you can definitely make it work and earn an income from a travel blog. In the meantime, a great way to earn money online while you’re travelling is by writing articles online. You may have seen those advertisements online that say “Learn how to make money while you sleep“. That is what the idea of affiliate marketing is all about. You sign up to affiliate programs such as ClickBank, Commission Junction and Awin, insert affiliate links onto your website, get your readers to click those links and let the money start rolling in. As you may have guessed by now, it isn’t as easy as just putting up an affiliate link onto your website and watching the money roll in. You need to have a large audience that reads your blog in order to get enough people to click on the links and buy the products you’re promoting. Until you have a large readership, don’t expect to make a huge amount of money from affiliate marketing. You should only promote products that you truly believe in because if you promote bad products, your readers won’t trust you anymore and won’t come back to your blog. To learn more about how to make money from affiliate marketing, I recommend checking out Affilorama. Sometimes companies will ask you to do a review on one of their products and in return, they’ll pay you. Really, or are you just saying that so you get paid? I really dislike bloggers who write too many sponsored posts (especially new bloggers) for products they’ve never even used. They say that “all opinions are my own” to try and keep the integrity of their blog but for the most part, they just say this so they don’t lose trust from their readers. Be careful when accepting sponsored posts, especially in the beginning (I don’t recommend accepting any) because it’s one of the quickest ways to lose readers and kill your blog. Putting up different types of advertisements on your blog is another way to make money from your blog. There are two main types of advertisements that you can promote on your website. You can advertise companies that you truly believe in and want to create a long-term relationship with or use Google Adsense (by inserting some code into your site). The problem with Google Adsense is that the ads you display are randomly generated, which means that you could be advertising anything (including ads that aren’t relevant to your readers). If you want to place advertisements on your website, I recommend reaching out to companies whose products you love and displaying their ads rather than using Google Adsense. The best and most honest way to make money from your blog is by creating a digital product such as Ebooks or online courses. By creating your own product and promoting it to your readers you’re able to keep the integrity of your blog, provide a useful product and keep 100% of the profits. Well, that depends on what your niche is and what your audience is interested in. For example, if your most popular blog posts are all about travelling long-term, you might consider writing an in-depth Ebook showing others how to achieve this. A great way to gauge interest about a certain idea is by creating a relevant magnet. Based on the number of email sign-ups to this lead magnet, you’ll be able to tell if people are interested in learning more about a certain topic. Furthermore, you can email the people that signed up to your lead magnet and ask them if they would be interested in learning more. From their responses, you can get some great ideas of topics to include in your digital product. 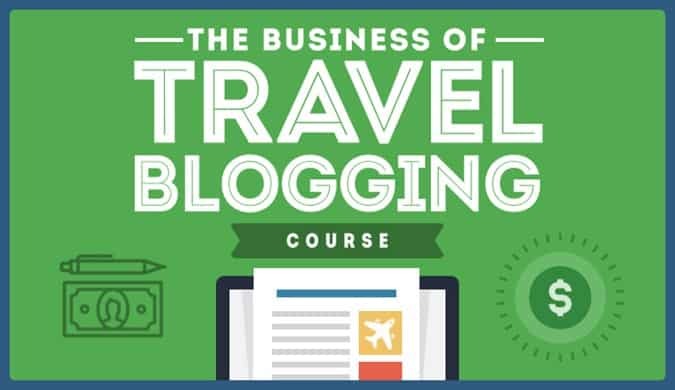 If you really want to take your travel blog seriously, then it’s definitely worth signing up for a travel blogging course. The best course out there at the moment is Nomadic Matt’s Superstar Blogging Course. …his content is awesome, and his Blogging Course in no exception! I hope this travel blogging for beginners guide helped you realise that starting a travel blog doesn’t have to be difficult. While you most likely won’t be making money a lot of money from your blog for a little while, those who focus their energy on telling good stories and providing value will win in the long run. If you follow the steps above on how to start a travel blog, you’ll be able to create an amazing blog that shares your unique travel adventures with the world. Blogging is my favourite method for sharing my travel experiences and knowledge, and it has been extremely effective for me because I followed the tips above. Don’t worry if you’re finding the whole process a little overwhelming. Start by taking the first step (choosing a domain name) and then work your way through the rest of the steps at your own pace. Happy blogging! I can’t wait to hear about all of your crazy adventures! Do you have any questions about how to start a travel blog? You’re right. Thanks for letting me know, I’ll change it now! In the end if you’ve got a blog started with someone other than WordPress that’s alright. You can always change later (even if it may take a little time). The most important thing is to just keep writing and fine your style for now. I took a look at your blog, I like the design and feel of your site. who did you use instead of WordPress?Squarespace? Weebly? Just a quick note the mobile functionality on some of your pages doesn’t work 100%. You might want to check that out. Very complete and useful guide! Excellent work. It helped me get started with a personal blog. Im glad it was helpful to you Henry. All the best with your personal blog!